I'm calling these two looks my "almost Fall, but not quite ready to let go of Summer" looks. The heat is still strong, and although we are only a mere 7 days into September you cannot deny the change in perspective. There is Halloween candy gracing the shelves, the colours burgundy and army green have taken over the racks, and the all-powerful pumpkin spice flavoured everything has returned. I'm not complaining, I really do love this time of year! I was just saying to Brandon we need to get on our Fall activity planning. Bring on the apple orchards, pumpkin patch and cozy nights in front of the fireplace! But sometimes dressing can be a bit of a challenge for this transition phase-- it's still rather hot, but you want to wear more darker colours and a few of your new pieces. Not to worry! All you need to do it replace your bright florals for those with more moody tones, swap your open toe sandals for a pair of flats, and pile on a few double-duty accessories. First up is the light scarf. This is definitely a double-duty accessories. Keep your hair back in the heat then switch it up and tie it around your neck to elevate a simple outfit and make a great statement. 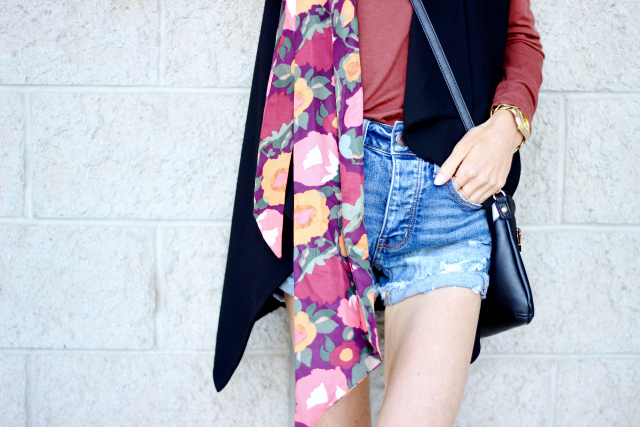 The darker tones in this floral print totally make it a season staple, even when paired with denim cut-offs. Since the weather is hot in the day, but brisk in the morning and evening a long vest does well to keep you warm, and it's adds more interest to the outfit. I equally love the scarf worn around the neck. I am usually a thick, wool scarf kind of girl, so this new trend is something I'm excited about. It's light, versatile (ties so many ways!) and adds a touch of drama. Too hot for your head and neck? Tie the scarf around your bag! Next up is the shift dress. I'm calling this a double duty accessory because really it's not the standout piece of either outfit but the rusty colour and longer sleeves definitely add to the Fall-ish vibes. Tucked into cut-offs, or worn as a dress, you can't go wrong. 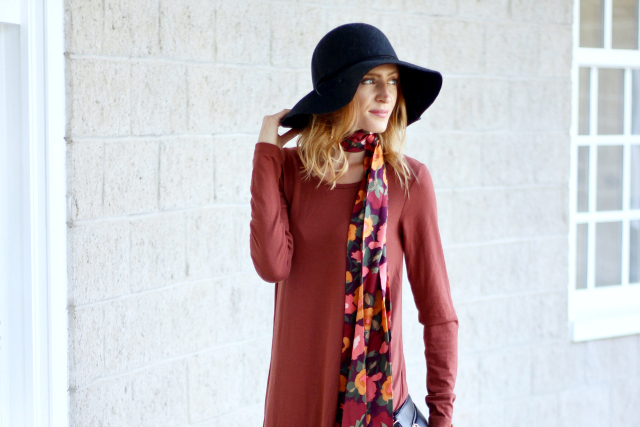 Since it's just a basic dress, tossing in accessories like a hat adds a bit of something extra to the look. I realize 50% of these pieces are from Target, and that you are probably laughing at me right now! Man, I really miss that place! I just had to do a haul while I was in NY last weekend! I scored major on these pieces, and there is still more to come. But, there you have it. 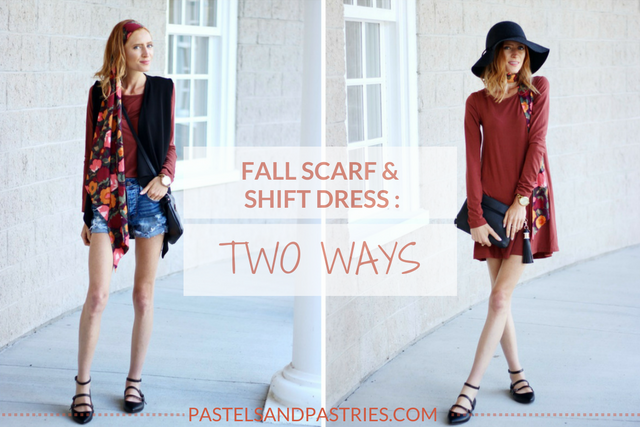 Easy tips on how to dress for the "almost Fall/still Summer" phase that is now upon us! 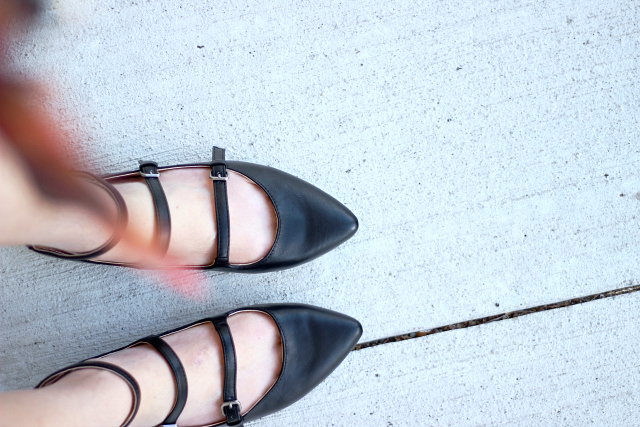 Do you have any tips on how you mesh your wardrobe for the seasons? I'd love to know! Such a good idea to style the dress as a top. Makes the two look so different. Fashion changes on a regular basis and therefore we have formulated a list of some of the happening summer styles.